Usain Bolt and Tyson Gay stayed on course for their 100 meters showdown at the world championships by coasting through their quarterfinal heats in Berlin on Saturday evening. Defending champion Gay surged through with a 9.98 seconds clocking, again showing fine speed after a sluggish start. Bolt treated the fifth and final second round qualifier as little more than a training spin as he made a good start and was talking to training partner Daniel Bailey of Antigua as the pair crossed the line. Bailey was given the nod in 10.02 with Bolt clocking 10.03 but the manner of his performance again suggested he will prove tough to beat in the medal round. 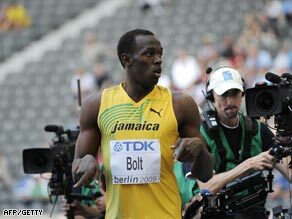 “I was happy, I didn’t need to do any more work,” Bolt told BBC Sport after his imperious qualification. His Jamaican compatriot Asafa Powell recorded the fastest time of the day as he won the second quarterfinal in 9.95 seconds from lane one after nearly going out by easing down too much in his first round heat. Britain’s Dwain Chambers, back in world championship action after a two-year doping ban, impressed again with a 10.05 clocking to win the opening heat. Bolt won the ninth of 12 morning heats in 10.20 with Gay claiming the penultimate heat in the fastest time of the session of 10.16. Blog: Bolt unstoppable in Berlin He looked untroubled but told reporters after his morning win that he was still suffering from a persistent groin injury which has hampered his preparations. “I feel okay but my groin felt a little sore,” he said. Gay is defending his 100, 200 titles and the relay crown he won with the United States in the world championships in 2007. Bolt secured the same triple in Beijing, winning the 100 and 200 in world record time then taking relay gold with Jamaica.